This was my first and, I assumed at the time, my only Half Marathon. I’d been living in Malmö, a small and uninspiring city in the South of Sweden. I was working out of my company’s office there as a base for travelling around the Nordics region. Most weeks I took a choppy 45-minute boat trip to Copenhagen to get to our larger office and the airport. The Øresund Bridge that now connects Sweden to Denmark was being built at the time. In June 200, just before the official opening, they staged a Half Marathon across the bridge from Copenhagen to Malmö. At the time it was the largest organised running event ever and it caused much excitement in the region. Although not being a runner, I was keen to keep myself entertained and to fit in with the locals. My Swedish colleagues were nice enough but I never really felt like I fitted in. So, when much of the office decided to do the race, I signed up straight away. On the morning of the run I took an early bus from Malmö town Centre to the start line at Copenhagen airport. My main memory was of about a hundred male runners lined up against the sea wall for a pre-race piss. They were also on the approach path of incoming planes, giving the pilots quite a eyeful as they came into land. 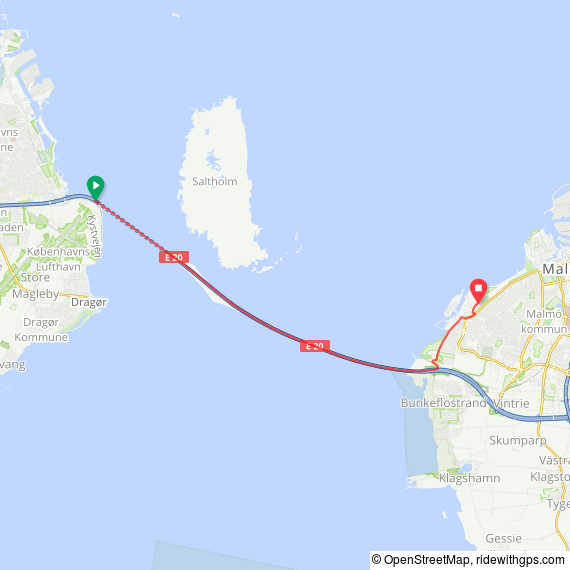 The first 4k of the route was in a tunnel leading under the strait. My start position was quite a way back in the crowd and the tunnel already had a strong aroma of BO. The tunnel emerged onto Peberholm, a man made island built to split the car and train traffic onto the upper and lower decks of the bridge. From here the route climbed steadily up to the high middle section over the main shipping lane into the Baltic. The apex of the bridge was somewhat surreal. We were on top of the sea with land several miles in either direction. Literally the high point of the race. From here it was an equally steady decent to the Swedish coast followed by the final 3 miles into the centre of Malmö. I was elated to have finished the race. Unlike today I didn’t have another 5 races already planned and it would be another 6 years before I gave running another go. By the time I’d signed up for my 2nd Half Marathon, the Broloppet had ended, reopening just once more in 2010 for the 10 year anniversary. Välkommen Till Broloppet: City Council of Malmö. Event, F10: 3. Click here for another blogger's account of the same day. This post was written in February 2018.